A contemporary electric dryer runs on a 240-volt circuit, and its motor and heater elements draw 30 amps when the dryer is running. At least, that's true for most of them. Some not-so-contemporary electric dryers run on 23 amps, and larger industrial units may draw 40 amps or even more. The current draw is listed on a label that is attached to the dryer, usually on the back near its electric control panel, which is the place where you attach the power cord. 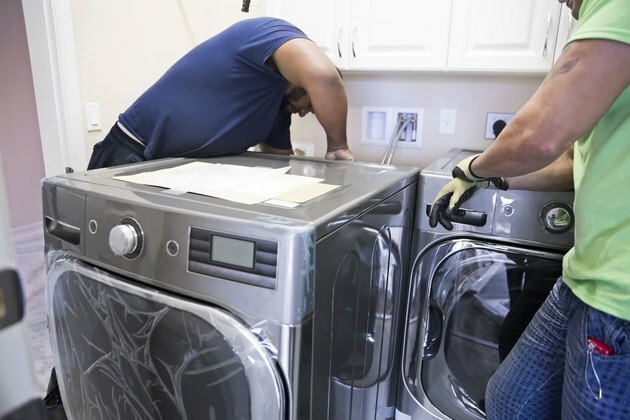 When wiring a receptacle for an electric dryer or hardwiring a dryer to the house circuitry, the number of amps the dryer draws determines both the size of the circuit breaker you need in the main panel as well as the dryer wire size. If your dryer draws 30 amps like most dryers, the dryer wire gauge is 10 gauge. If the dryer draws 40 amps, you need to upgrade the wire to a beefier eight gauge. Keep in mind that larger gauge numbers denote thinner wires and vice versa. Because a dryer runs on 240-volt power, you need three-conductor cable to connect it to the panel. The cable contains two hot wires covered in red and black insulation, a neutral cable, which is white, and a bare ground wire. The ground wire isn't considered a conductor. It's there as a safety measure. The National Electrical Code currently requires every circuit in the house to be grounded, including all 240-volt ones, but that wasn't always the case. In the not-too-distant past, the NEC permitted ungrounded receptacles and cords for electric dryers. This is why your old receptacle may have only three prongs, while your new dryer came with a four-prong cord. Because three-prong receptacles are still fairly common, some manufacturers even ship dryers without cords so you can install your own. Whether the dryer comes with a cord or not, there are four terminal connectors. Two are for hot wires, one is for neutral and one is for ground. It's legal to connect a three-prong cord to a dryer with four terminals, but you have to make an important modification. Instead of connecting the ground wire – which you don't have – you must install a jumper wire or bonding plate between the ground and neutral terminals. The bonding plate is sometimes supplied with the dryer, and when it is, it usually isn't connected. You must connect it to install a three-prong cord. In the opposite case, when you want to plug your old three-prong dryer cord into a four-prong receptacle, the easiest solution is to use a four-prong dryer outlet adapter. Plug the adapter into the receptacle, attach the ground wire on the adapter to the metal body of the dryer and you're done. When you purchase a cord, check the current draw for your dryer and buy a cord that is the proper gauge. Most dryer cords are 10 gauge, but if you have a large machine, you may need a more heavy-duty cord with eight-gauge wires. Always check the label on your dryer for the current draw before purchasing a cord. It's not a big deal if you oversize the cord, but if you undersize it, the wires could overheat while the dryer is running and start a fire. How Do I Wire a 50 Amp 220 Plug? Do They Make Electric Dryers That Run on 110V?